If you are anything like me, you love to shop for home decor, especially attractive and sleek candles which pull the look of a room together and brighten it up, all while adding a pretty scent. However, if you continue to be like me, you also like to keep those candles lit most of the time, which means they burn out fast, leaving you with plenty of pretty little glass vessels and not much idea of what to do with them. Luckily, there are tons of ways you can upcycle these vessels, whether they are big or small. The first step, of course, would be to get the wax out. 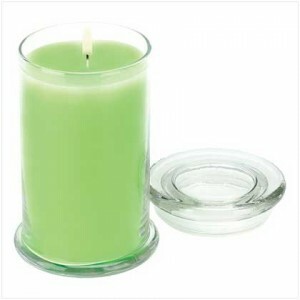 Some candles have very soft and pliable wax which can simply be scooped out, or hardened wax that has separated from the vessel which pops out easily. Either of these can go right in the dishwasher or be washed by hand once the wax is gone. However, sometimes you will run across a stubborn bit of wax at the bottom of your candle jar. To get rid of it, just pop the candle in the freezer for a day or so, break up the remaining wax with a butter knife and dump it. Give it a thorough cleaning, and you are all set. So, what can you do with all these jars? One of my favorite for small, clear candle jars with lids is using them to store either small office supplies, hair ties or bathroom supplies. Being able to see right through the jar means I never have to wonder if I am fishing around for a rubber band or a paper clip. Small jars also make things like cotton balls and swabs easily accessible and allow you to save time digging around. They also allow guests easy access to such things if they need them without feeling hesitant about asking. Large candle jars with unique shapes are great for holding your pens and pencils. Tie some gross grain ribbon in a bow around the jar, and you have a cute caddy for your writing implements. They can also make lovely flower vases for the blossoms you just cut fresh from the garden. One of my favorite uses is a little more unorthodox, but I love it just the same. I am a makeup lover, which means I have a ton of brushes, mascaras, and skinny pencils for eyes and lips. I filled an old candle jar with craft sand, tied a ribbon around the rim, and use the jar for easy brush identification and storage. I never have to sort through my makeup bags and boxes looking for my eyeshadow brush or my concealer brush and my eyeliner is always right where I left it. I keep extra packages of Arby’s and Taco Bell sauce in them in the fridge! Lots of uses – Thanks!! However, I don’t agree with the use of craft sand for pencils for EYES! Too risky!